The latest reaction inducted in the Chemical Reaction Database (CRD) is lifted from an article by Feng-Zhi Zhang et al. (DOI) about intramolecular etherification by activated alcohols. Is hot water as advertised in the title an efficient reaction promotor? Or is water just a terrible solvent given that the reaction requires extensive heating for it to work? Given that the reactant is a liquid at 100°C, could one actually do away with the water and make it a no-solvent reaction? The reaction scale: 13 mg of reactant in 50 ml of water also raises concerns. On the other hand, many points for carefully listing the systematic names of the newly synthesised compounds, essential as raw CRD input. The Dutch universities are at war with scientific publisher Elsevier. The newspaper NRC with Marcel aan de Brugh has the story. The universities are demanding that Elsevier adopts an affordable open access business model. If it is up to Gerard Meijer, the chief university negotiator, a boycott will start before the summer if the publisher does not yield. Meijer will first ask university staff to abandon editor positions at Elsevier, then staff is expected to stop reviewing and ultimately to stop publishing in Elsevier journals. In this the universities are following up on the 2013 announcement by the Dutch Education Minister that by 2024 all scientific academic output must be open access. More specific in this business model the author pays a fixed sum. It is the same model that the UK has adopted. Other European countries are leaning towards a so called repository model in which subscriptions still exist but then the authors make copies available to the public. It remains to be seen though if the open access model will mean a cheaper deal for the universities, with a price-per-article of about 1000 to 1500 euro's, the model may even be more expensive. An open-access article in a hybrid journal may even cost 5000 euro's. The chief science editor of the same NRC newspaper has another suggestion: self-publish your articles. He explains that the costs of publishing only sky-rocketed in the nineteen-seventies, the inventor of the currently very lucrative publishing model is non other than the then Elsevier CEO. You may have missed it: an ambitious survey on the so-called skills gap in Bachelor level education as published in the Journal of Chemical Education (DOI). What do chemical companies think of Bachelor level education? There is some interesting data to be found. For example for organic chemists in chemical industry the top three chemical reactions used are organometallics, esterification and Sn2 reactions. Compare this the the top three chemical reactions taught at university: electrophilic aromatic substitution and reductions with hydrogen or metal hydrides. Esterification is in sixth place. Chemical industry apparently is not ready for microscale chemistry otherwise a popular topic in academics. In terms of chemical techniques industry stresses the importance of extraction and filtration but in education the number one asset is recrystallisation. The top three instruments used in chemical industry are HPLC, NMR and the humble Ph meter. And finally, what would you think are the most important hiring factors? Grade point average comes at a measly number 5 well after interpersonal skills (1), team work (2), undergraduate research (3) and internship experience (4). These data possibly reflect the regrettable standard practice in industry that the actual hiring is done by human resource departments with their misguided socio-psychological doctrines rather than by the chemical peers. Good news for students though, please carry on partying. In a recent report (DOI) Daley et al. express surprise that of the many bonds containing boron that have been used in the exploration of addition reactions, for example the B-H bond in hydroboration, the boron - phosphorous bond is not one of them. Triggered by a 2013 report by Breuning (DOI), the first on this topic, Daley ventured further. 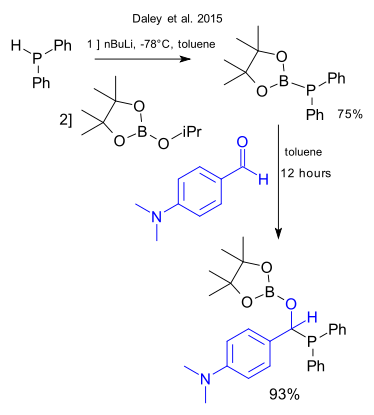 A compound containing a P-B bond was constructed from diphenylphosphine and 2-isopropoxy-4,4,5,5-tetramethyl-1,3,2-dioxaborolane. This compound was found to react in 1,2-addition with aldehydes without the need of a catalyst. Other substrates uncovered were allenes and terminal alkynes (though requiring a catalyst). It is a bit curious that this type of new chemistry appears well after the introduction of frustrated Lewis pairs that also deals with P/B chemistry in a comparable way.